There are still model yacht ponds in many cities. 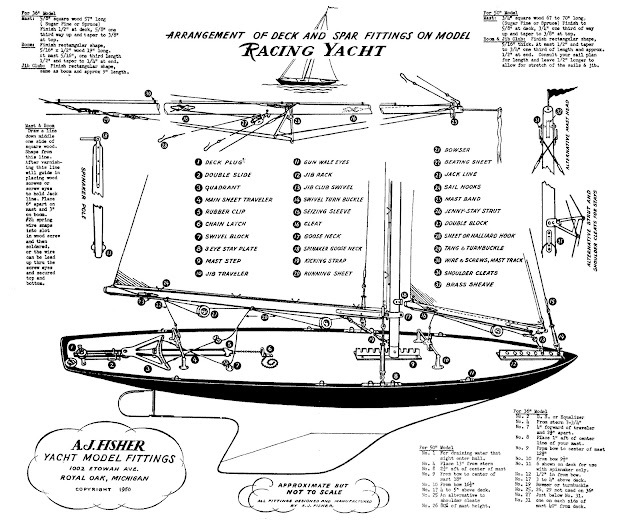 I used to run past the one in Golden Gate Park every day and occasionally saw a boat or two out in its shallow water. Conservatory Water in New York's Central Park is still well used. Most model yacht basins date back to the 1930's, when Roosevelt (a model-yacht enthusiast since childhood) encouraged his Works Progress Administration to build them in parks across the country. The Belle Isle Model Boat Basin is actually a bit older than most model yacht basins, built on the southern side of the island in the 1920s. 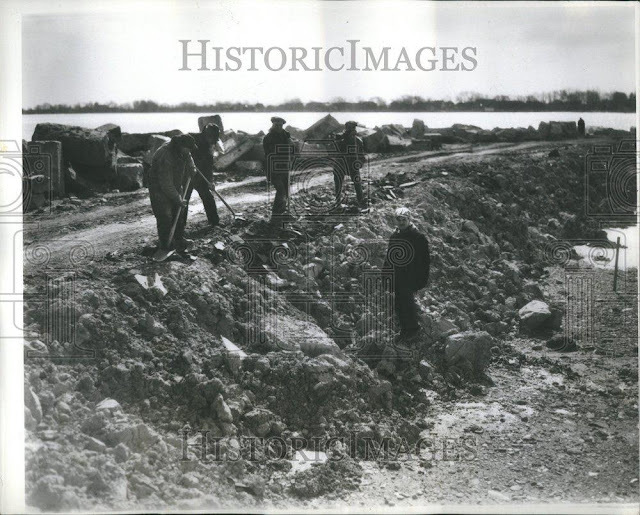 Forgive the watermarks---many of the only available images of the Yacht Basin are from the Detroit News archives, which sold its entire collection of news photos to some company called "Historic Images" that now auctions them off on eBay. 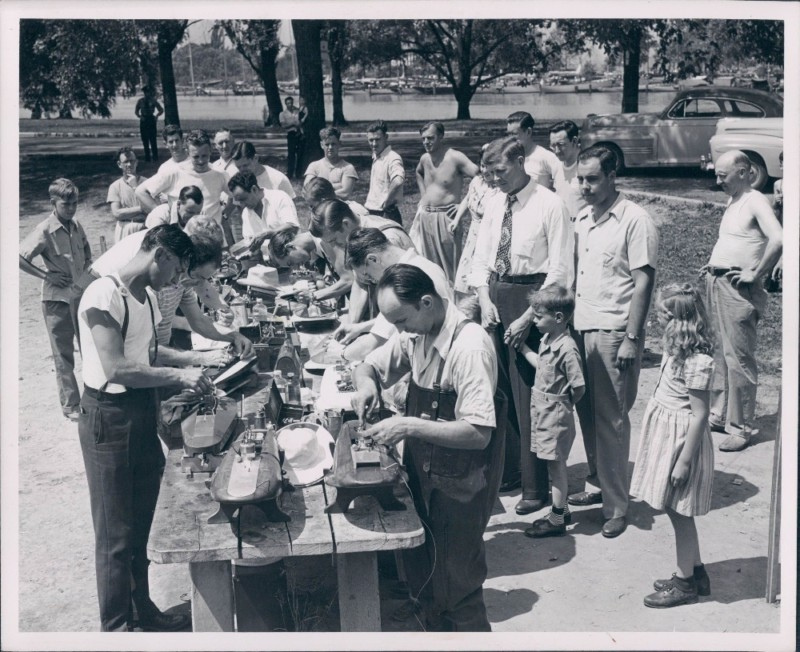 With the number of "real" yacht clubs up and down the Detroit River, it's not surprising that model yachting was popular in Detroit. 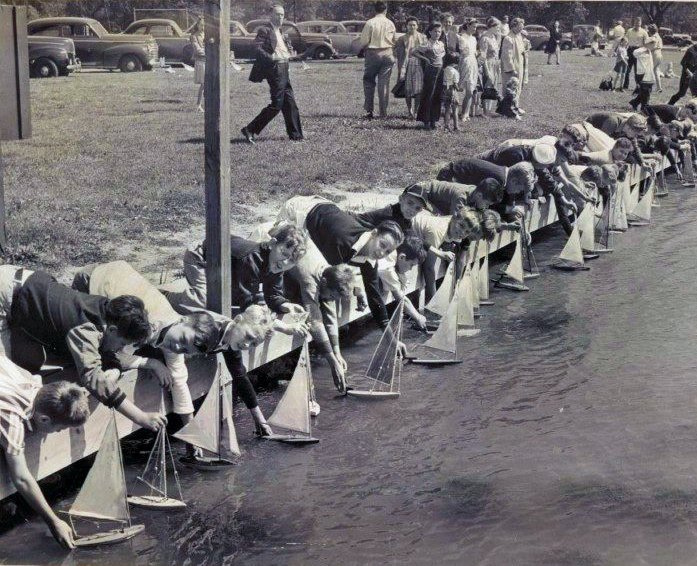 Michigan, after all, has more registered boats than any other state and no matter where you are you're never more than a couple hours away from open water. 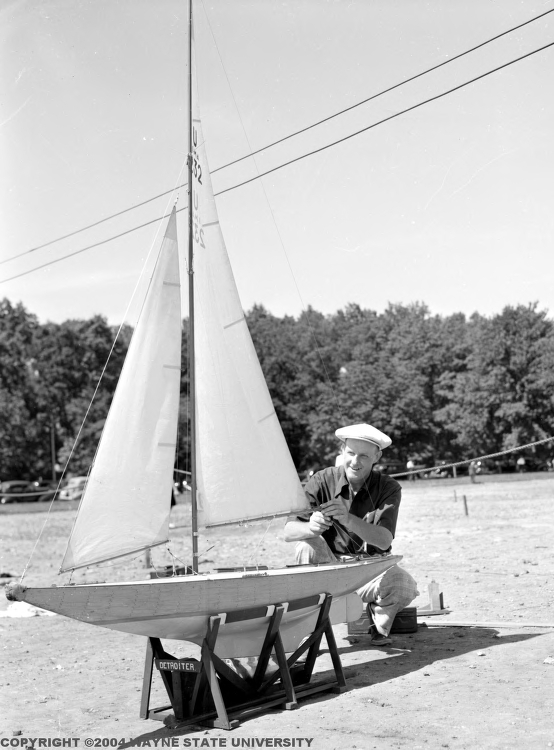 A beautiful, hand-made model yacht allows even a working class kid to captain his own ship. 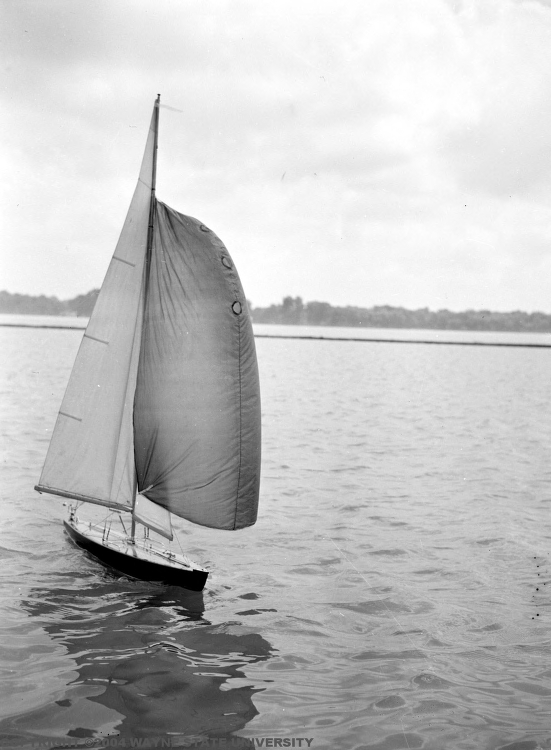 Model yachts were popular with high school manual arts teachers (and students) at the time all over, and the Detroit Public Schools boasted the longest-lived high school model yacht program in the country. Back in 1927, Detroit Public Schools manual arts instructors Earl Phillips and Charles Pozzini (a nationally-known carver of wooden decoys) were inspired by the races held at the new Belle Isle Model Yacht basin to start a model yacht club in their school. 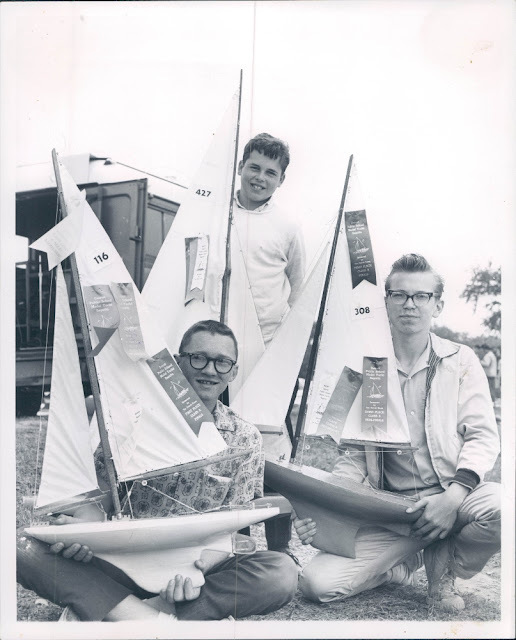 The two teachers became well-known for their successful program and even authored a book about how to build and race model yachts. A company called A.J. 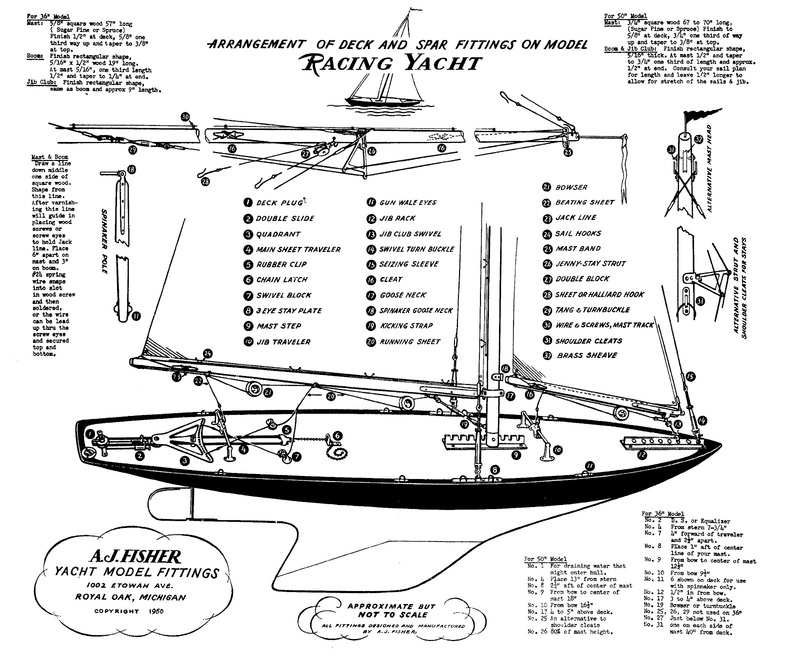 Fisher, Inc. based in Royal Oak sold their plans (with complicated non-RC steering mechanisms) to model yacht enthusiasts for many years. At the height of Phillips and Pozzini's model yacht program in the Detroit Public Schools, hundreds of students would build their own boats and compete all day against each in a Regatta sponsored by the Detroit News at the Belle Isle Model Yacht Basin. Look at the guy in the waders! 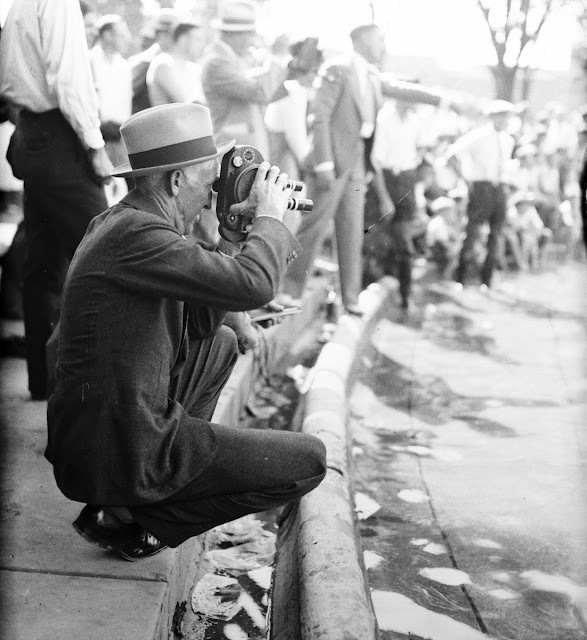 I hope that's Mr. Pozzini! 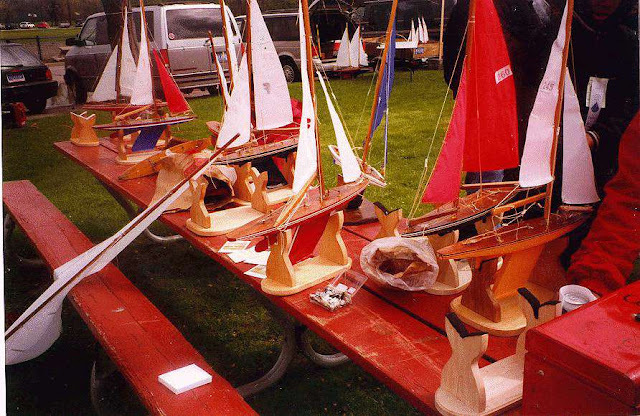 The Belle Isle Model Yacht Regatta lasted well into the 1990s, even after the program in the Detroit Public Schools seems to have ended. 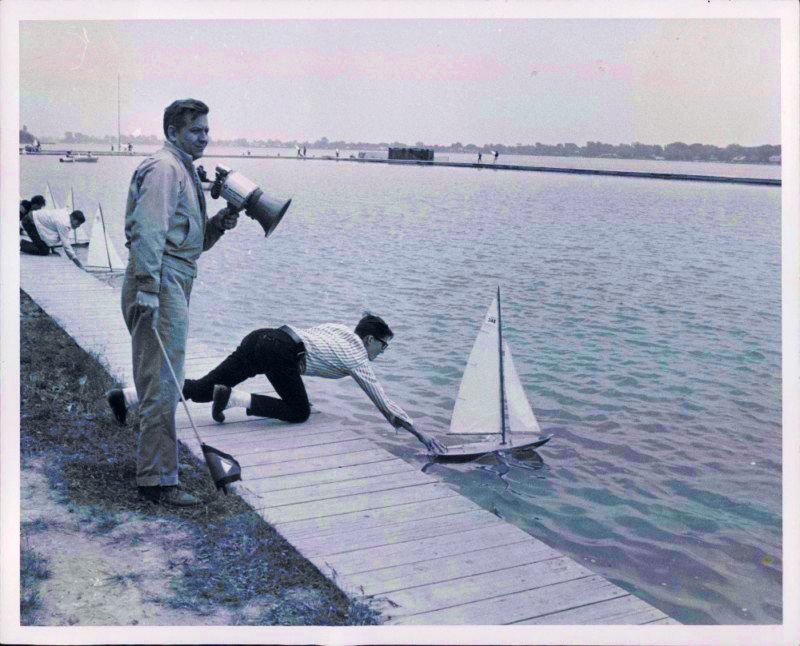 Suburban schoolteachers took up the reigns of Phillips and Pozzini brought suburban model yacht builders down to Belle Isle through the 70th annual Belle Isle Model Yacht Regatta in 1998, but I was unable to find any information about whether the program ever lasted beyond that (this site preserves a great record of that 1998 event). 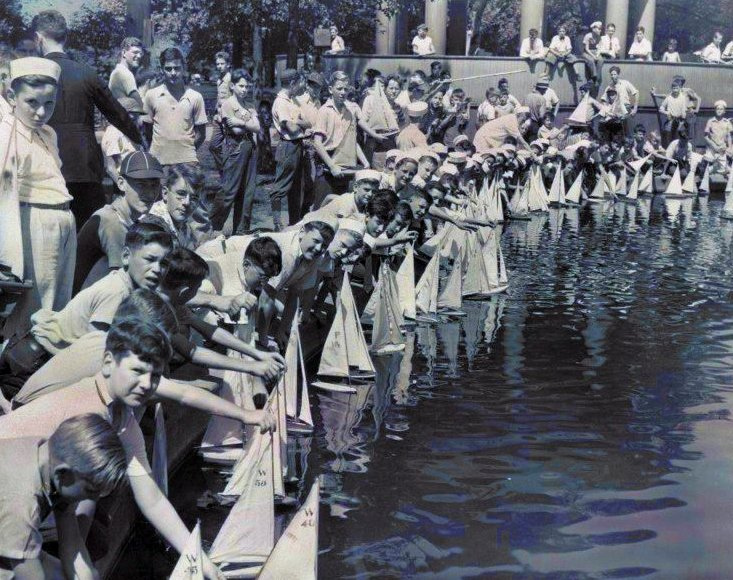 The Detroit News as a sponsor of the event is a greats source of vintage images, but its archives dating back to 1999 contain no mentions of model yachts on Belle Isle. Comparing the pictures of that 1998 event to the pictures from its heyday, it seems the Model Yacht Basin was already pretty neglected fourteen years ago. Today it is overgrown and full of garbage, while the water itself is clogged with plant life that makes model yachting difficult. 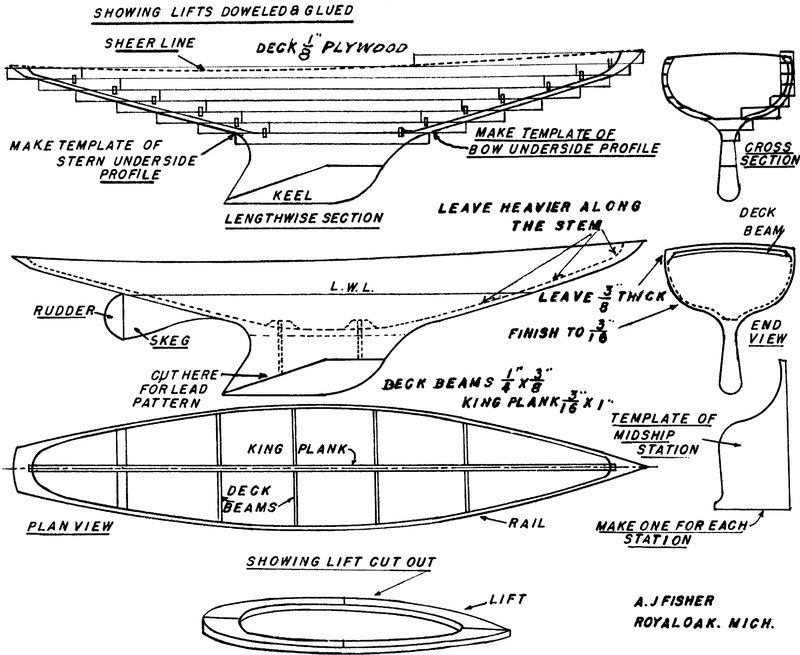 Today most of the boats that people use in any model yacht basin are remote controlled, and even wind-powered sailboats have advanced controls that allow their remote captains to pilot them just like real ships. 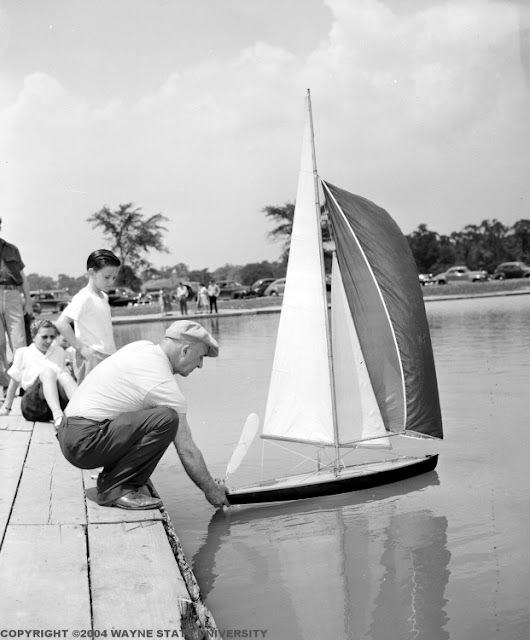 Today there is still a very active Detroit Model Yacht Club, but their boats now sail in Joseph J. Delia Jr. Park Pond in Sterling Heights, Michigan, on 18-Mile Road. I recently saw a father and son playing with a remote control boat in the drainage pond behind an IKEA. 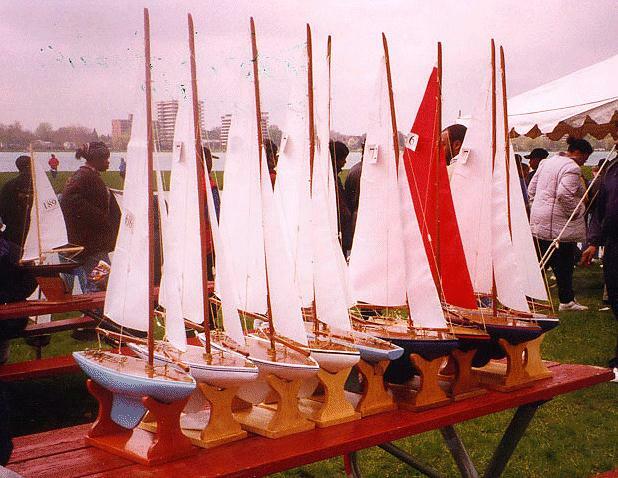 In the hundreds of times I have been to Belle Isle since 2006, I have never seen anyone using the Model Yacht Basin. Other than the sign identifying it as such, today there is no reason to think it's anything other than just another pond.